Roti Everyone loves roti! It is the fast food of the Caribbean, and you can find Roti restaurants the world over. People always think of jerk chicken when it comes to West Indian food, but Roti is one of the most popular foods in the Caribbean. Roti was brought to the islands by the East Indian contract labourers, as early as 1840. Although Roti is East Indian in origin, it has been localised as a Caribbean dish. Roti is hugely popular in Trinidad, where just under half of the population consider themselves to be of East Indian background. Today Caribbean/East Indian dishes are quite different from traditional East Indian. 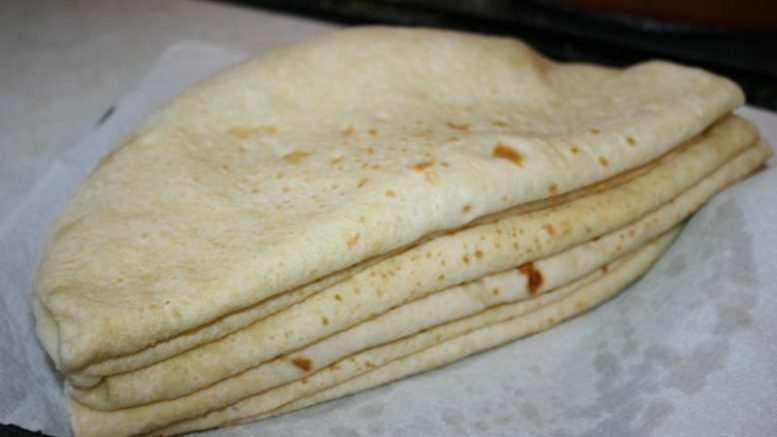 For those who don’t know, a Roti is a flour pancake or wrap, similar to, but lighter than a tortilla, and filled with various foods, including curried chicken, goat, shrimp, channa (chick-peas). West Indian roti are mainly made from wheat flour, salt, and water. Jerk and Creole sauces are alternatives to curry. The word ‘roti’ in the West Indies also refers to a dish of stewed or curried ingredients wrapped in a ‘roti skin’. In Trinidad and Tobago various rotis are served. Popular variations include chicken, conch, beef and vegetable. There are different types of Roti including Dhalpouri, Dosti, Bus-up-shut (Paratha ) and Sada roti. Sada Roti: is similar to naan and cooked on a tava. This type is very popular in Trinidad as a breakfast option. Paratha Roti: Roti made with butter, usually ghee, also cooked on a tava. Oil is rubbed on both sides, then it is fried, giving a crisp outside. When it almost finished cooking, the chef will to mash the roti while it is on the tava, causing it to crumble. It is also called ‘Buss-Up-Shut’ in Trinidad because it resembles a ‘burst up shirt’. Dhal Puri Rotitava. It is also rubbed with oil while cooking. It is called dosti roti because the word dosti means friendship in Hindi. This type of roti is eaten in Guyana with a special halva to celebrate the birth of a child. Dhalpuri: Popular in Trinidad, this roti has a stuffing of ground yellow split peas, cumin (geera), garlic, and pepper. The split peas are boiled and ground. The cumin is toasteduntil black and also ground. The stuffing is pushed into the roti dough, and sealed, then rolled flat. Bake: Bakes are similar to roti, and popular in St Lucia. Shark and bake, also a popular Trinidadian snack. Dough is rolled out and cut into shapes or rolled into small rounds. These can be baked in an oven, but they are usually fried in oil. They are sometimes called frybake. Bake are usually paired with a fryup for breakfast or dinner, or with stewed saltfish. Roti is a great dish for any occasion, as well as being quick and healthy. Be the first to comment on "Roti – Caribbean Food"